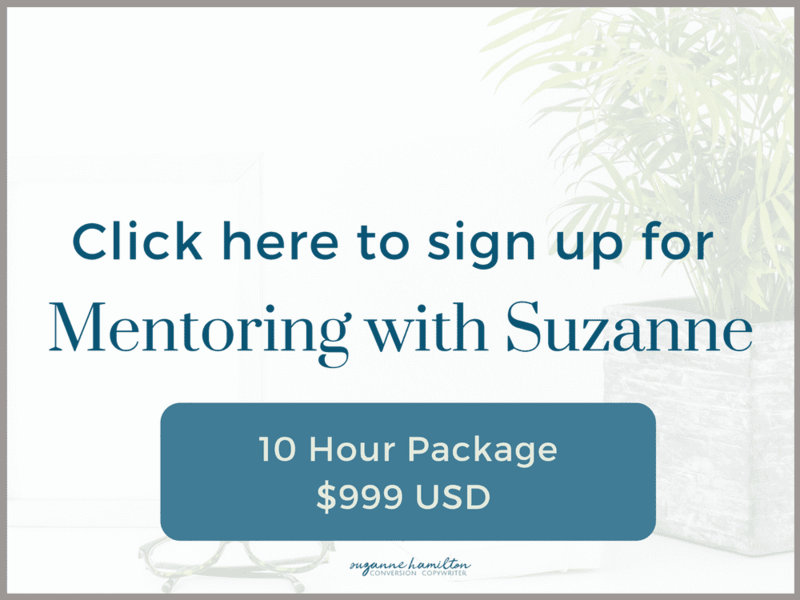 Suzanne has been the single biggest gift to my copywriting business. From our 1:1 zoom calls to getting quick answers and resources via slack, to receiving leads and reviewing all my work – she has been my secret weapon for the growth of my biz. She has truly had my back as a mentor! I have more than tripled my income since working with her and cannot express enough the potential for growth your copywriting business has too, by linking arms with the magic that is Suzanne! Suzanne took me under her wing when I began my copywriting and digital marketing business. I was initially attracted to her humor and amazed by her superb copywriting skills. She took time to explain things to me, gave me examples, and connected me with other well-known copywriters. I appreciated her patience, willingness to share, and her mentorship. She is the real deal. All sales are final. Hours must be used within 6 months of purchase unless otherwise agreed upon in writing by you and me! If for some reason I don’t think we are a good fit for mentoring once I’ve received your application, a full refund will be issued.